this transformation could not have been more dramatic. before we started with the renovation the living space was dark, broken up and enclosed. we installed a 8' slider for access to the back yard, we took out all the walls separating the kitchen and the dining room. we raised the ceilings in the kitchen and dining room and scraped off the popcorn texture. all new recessed LED lighting was installed, the kitchen and dining were relocated for a better flow and open concept entertainment space. 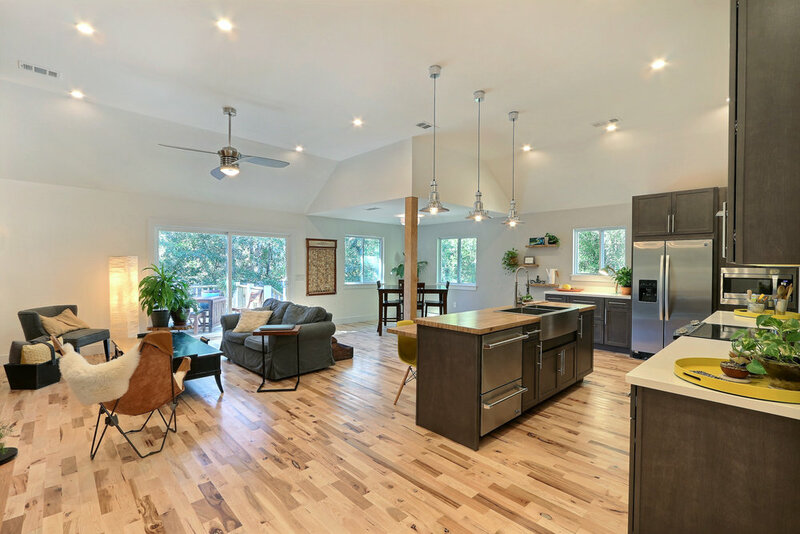 the new hickory flooring connects all spaces and creates a beautiful texture within the space. the feeling of openness and the amount of light that this space gained is fabulous. the kitchen was designed for maximum storage and functionality. 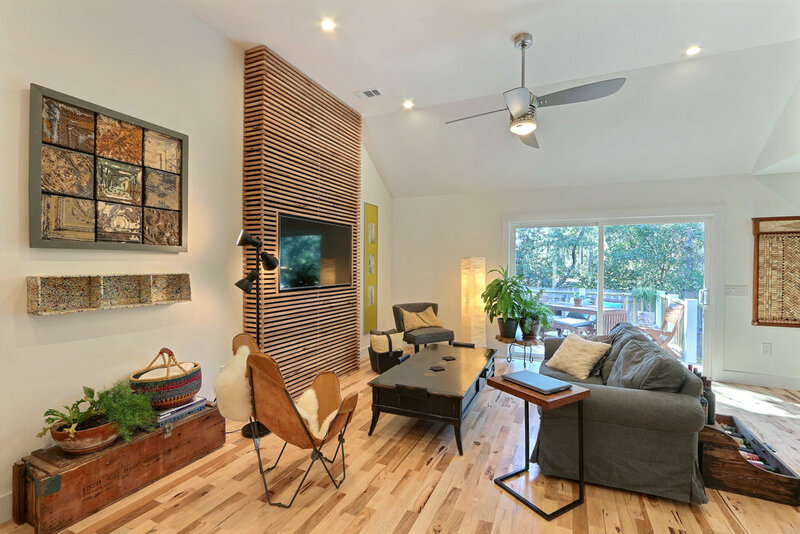 the result of the renovation could not feel more inviting, welcoming and like a home. this view showcases the sheer volume of space we gained by removing all the separating walls and unifying the dining, living and kitchen. the ambiance of the space is fabulous and grand while maintaining an intimate and homey atmosphere. the kitchen features quartz counter and wood on the island. large heavy-duty drawer bases offer great and convenient storage and the amount of counter space offer several work areas. the tiled backsplash extends to the raised 11' ceilings behind the hood. the smooth finish of the sheetrock and grey feature wall with floating shelves give it a contemporary and modern feel. the stainless steel appliances and interior finish selections in this space make it feel like a custom kitchen. the master suite renovation required some unique space planning. we scraped popcorn off the ceiling and created an open bathroom concept by removing walls and enclosing the toilet in it's own space. the flow is beautiful and the atmosphere in the space is spa-like. 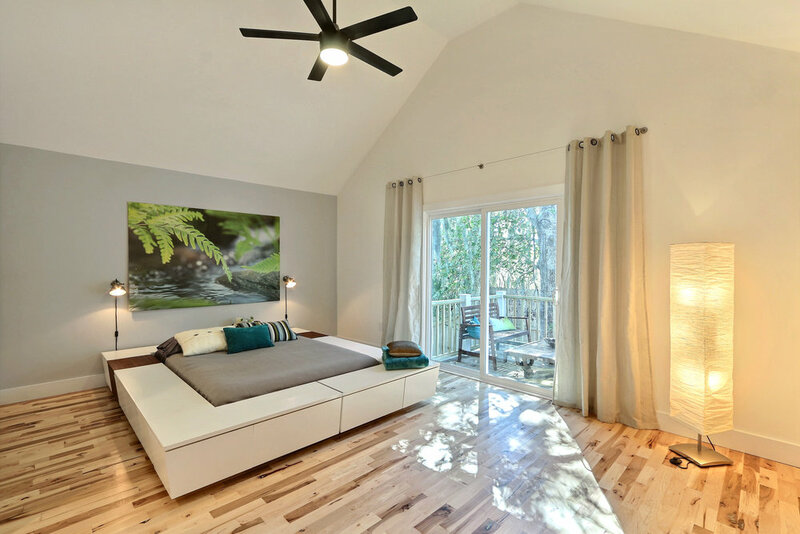 the new 6' slider that allows access to the back deck floods the space with natural light that extends to the bathroom. the vaulted ceiling give it feeling of space and the accent wall anchors the bedroom. the bed was custom designed and built by designATplay and features drawers around the entire perimeter for storage. it's a multi-functional piece that is not just a sculptural elements but offers seating and indirect lighting underneath. the master suite also features a custom built walk-in closet with ample storage and different kind of organizers.